I previously talked about adding a BottomNavigationView to your native Android apps using Java (Android.Basics – Adding a Bottom Navigation View), but I couldn’t leave my Xamarin buddies out! 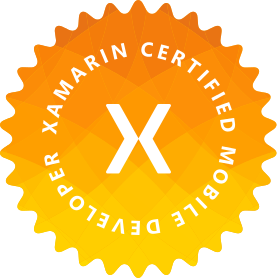 Consider this phase 1 in moving your tabs to the bottom of your Xamarin apps! In this post, we’ll look at a basic implementation of the new Material Design BottomNavigationView in Xamarin.Android, and in a later post, we’ll implement it in Xamarin.Forms with a custom TabbedRenderer. The BottomNavigationView uses a menu to create the items in the navigation view, so you’ll need to create an xml resource under Resource/menu. Note that the images I use are from my previous post, and are included in the source code in GitHub linked above. Add an android.support.design.widget.BottomNavigationView to your layout, or you can now add it easily in Visual Studio (for Mac) in the design view by selecting it on the right. Just make sure you properly set the layout_width and layout_height to meet the standards and also add elevation to give it the shadow and solid background. Xamarin did a great job of wrapping the Java listener with C# events so we can add the event handlers we know and love to handle changes when an item is selected in the BottomNavigationView. Because of this, you also need to set the theme of your Activity to something that is a sub-theme of Theme.AppCompat. Hi, did you ever do a post about implementing this in Xamarin Forms using a customs renderer?